If you've gone to a First Friday and felt overwhelmed, you're not alone. 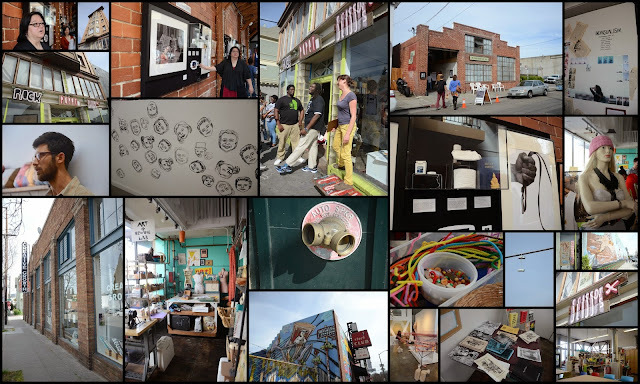 What started as the monthly Art Murmur to get people interested in art and the growing art scene in Oakland rapidly grew to include a street festival, food trucks, and other happenings. In the words of Yogi Berra, "Nobody goes there anymore. It's too crowded." If you want the art but not the crowds, there are some options. Every Saturday, many of the same galleries and art spaces take part in the Saturday Art Stroll. It's a chance to see the art, talk to people in the galleries, and take in things at a slower pace. Once a month on the third Saturday, they also lead special tours. This past Saturday the Saturday Stroll art tour started at Warehouse 416 with a powerul exhibit from the Foster Youth Museum. Then it was over to Creative Growth Art Center, which serves adult artists with developmental, mental and physical disabilities, and provides a professional studio environment. Creative Growth also includes a gallery space where the work is shown, and a small store where some of the art is available for purchase. Steve Oriolo, who runs the wood studio and the Saturday youth program, kindly stuck around and showed the large group the space and then answered questions. Our final stop was the Rock Paper Scissors Collective, one of the original founders of the Art Murmur. RPS works to foster creativity and collaboration through free and low-cost art classes. It's all volunteer run, and in need of some financial help, so considering volunteering or donating to help keep it running.